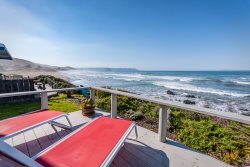 Stay in this beautiful and magnificent monthly furnished vacation rental located on Studio Drive in Cayucos! Cayucos is so unique and charming and this home is a true Cayucos gem! Past guests come year after year and have mentioned the bonus room makes this home so desirable along with the views from the living room area and the private staircase to the beach! IMPORTANT INFORMATION REGARDING AVAILABILITY CALENDARS: Please call our office to ask about any date inquiries for this home and verify availability.This is a month unit though one booking per month is considered. We loved this little house. It is on the petite side, but because the one bedroom is separate, it worked really well for us. Everyone had their own space. The location is gorgeous - it's a short drive into town, and the beach is stunning! We were just a few houses away from the river, and the boys thoroughly enjoyed playing in it. The few issues we had on the property were taken care of by Beachside Rentals quickly - very professional and lovely to work with. Thank you for a beautiful family vacation. We'll see you next year.